I just returned from a quick break with my family in the sunny Canton of Ticino where we spent most of our time in Lugano. We have been visiting Lugano regularly since I met my husband 15 years ago His parents own a holiday home there and we are lucky enough to be able to use it for both short and long getaways on weekends as well as during school holidays. For us it’s an easy escape as long as we can beat the traffic at the Gotthard Tunnel. As friends and blog readers head to Lugano, I am often asked where we like to eat. Over the years we have collected a long list of places where we love to indulge in yummy Italian food. So today I thought I would share it with you. Located in a quiet piazza behind the department store Manor, Cantinone has been a favourite of our family for years. Wood-fired pizzas and delicious Osso Bucco with risotto are amongst our favourite dishes here. This would probably rank as one of our top family-friendly picks in Lugano because when it is warm enough, sitting outside is a real treat. And where we’re eating outside, the kids can safely run around without the fear of disturbing anyone. My in-laws have been talking about “the loch” (translated to “the hole in the ground”) for years, and I could never figure out where they meant. It wasn't until our whole family surprised my mother-in-law for her 70th birthday at this restaurant that I finally got to see what they had been talking about all these years. Located underground in a side street off the main Piazza, it would be easy to miss this authentic Ticino restaurant. Owned and run by two brothers who couldn't be friendlier, you can drink Ticino Merlot out of Boccolinos (traditional ceramic jug-like mugs) and enjoy authentic Ticinese food. Finish your meal off with a fine Grappa! I visited this restaurant with a very grumpy and tired little Z after a long drive from Venice to Lugano back in the spring. It was early Sunday night and I was hoping to finally try out this restaurant which always looked packed when I’ve walked by in the past. This time I was in luck as by going early (it filled quickly) and we were able to get a table. The food was fabulous (seafood is a speciality), as was the service. Hidden away in a gallery arcade off the main area of Lugano, you wouldn’t stumble upon this unless you were wandering around. The staff were extremely patient and friendly despite my grumpy 3 year old. On the main road in Lugano which divides the city and the lake, you will find the Spaghetti Store. Here you will get everyday normal spaghetti in lots of varieties. It’s nothing overly special, but when your kids have a varied palate and you want a wide choice of pasta options this is the place to visit. Pizza is also on the menu. Not only were our kids welcome here, they were almost put on a pedestal, with the staff chatting with them every time they walked past. They speak good English and German. Sometimes when you are traveling you just want something easy and quick. Manor Restaurant ticks both of these boxes in a predictable way. Manor restaurant has a self-service buffet-style restaurant with salads, vegetables, main meals and desserts any time of day. It gets busy over lunch, but we still found a spot to eat in the outside area when we came during lunchtime. If you want a great sandwich, you will find them underneath the large salamis hanging outside Gabanni. There are lots of different types of breads and fillings, and I can highly recommend the Melazanne e Prociutto Sandwich (eggplant and cured ham). Sandwiches are a value at 7chf and we usually take ours to the park to enjoy. 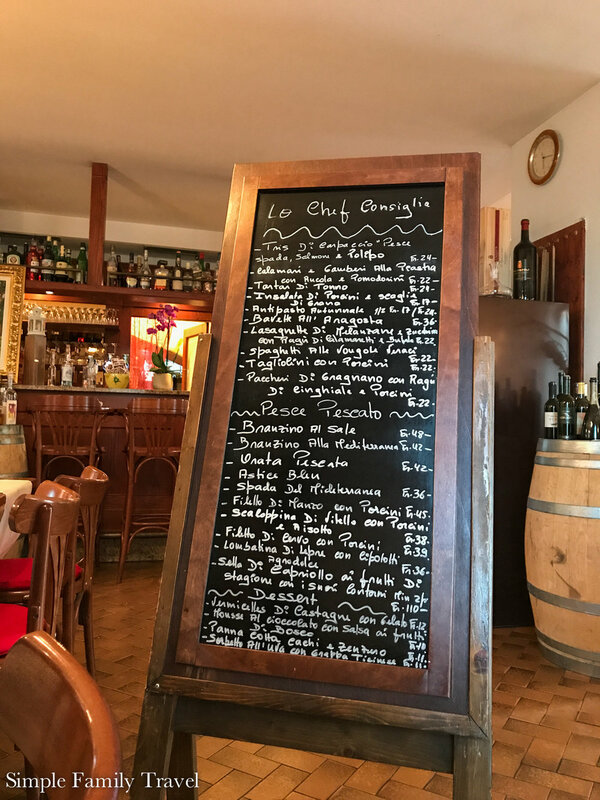 If you have walked around the lake and find yourself in Lugano Paradiso or perhaps if you’ve just come down from a visit from San Salvatore and are craving some pizza you can try Restaurant Verace. Known for their traditional Napoli styled pizzas (thick outer crust, thin base, lots of sauce) Verace has so many different pizzas you will find it hard to choose. They also have a small menu of other things, but we come here strictly for the pizzas. A word to the wise: don’t come here if you are in a hurry! The times we have visited they have had limited staff, and with only one person serving, one person in the kitchen, and one person making pizzas, it can take awhile to get your order. But in my opinion it’s well worth the wait, and hey—I’m on holiday so I’ve got nowhere better to be! This is my favourite restaurant in Lugano, and not only because its only a short walk from our home base. The food here is just fantastic and despite communication problems (my Italian needs some work!) they are extremely welcoming and friendly. We avoided this restaurant for years based on it’s limited curb appeal. How wrong we were! The menu is seasonal and presented on a chalkboard, handwritten in Italian. The food is made to a high standard and everything we have had here has been delicious. There is a small standard menu translated into German and English for those wanting to go that way, but I suggest to preload your Google Translate app and go for something off the chalkboard. My most recent meal was Lobster with homemade pasta - sooooooooo good. They specialise in fish, so fish lovers are catered to. Maybe you would like to try the fish baked in a salt crust? Kids are kept happy with a pizza menu and the restaurant is also happy to cook pasta with tomato sauce or butter and cheese for the less adventurous. We often order a steamed vegetable plate on the side for little Z.
Capo San Mostino, via Cantonale, Lugano Paradiso? Considering Lugano is set on the lake, it’s surprising that there are few restaurants that sit directly on the lake itself. If you are looking for a restaurant with the “wow” factor, consider a visit to Capo San Mostino. They serve everything from pizzas to higher priced meals, and its location high up over the lake between Lugano and Melida affords stunning views back down towards Lugano. I would follow the suggestions on Trip Advisor and visit here when it is less busy (either early, or during the week), because on evenings and weekends when it is busy it seems that the service suffers. You might be surprised that I would recommendthis place, as it does appear quite fancy and not the kid friendliest, but if you go early enough you can enjoy the spectacular view with minimal fuss. So if a view is what you are after, go for it! Once on a boat from Lugano to Gandria I had admired the Grottos along the other side of the lake. Considering my picky eaters we were hesitant to venture out further than our tried and tested restaurants back in Lugano. But during one visit last summer when it was just Z and me, I decided to go for it. Grotto Teresa was my choice. We got off the boat at Cantine de Gandria and found a table under the trees overlooking the lake. I enjoyed red wine out of a boccolino and we both enjoyed our delicious food. Since we visited I have learned that Grotto Teresa is under new management, but I am hoping that the food has stayed as good as it was because the location is beautiful. I’d appreciate hearing back from my readers if you’ve had an experience there recently. On the Lugano side of the lake walking back from Gandria to Lugano you will stumble upon Grotto Elvezia. The food here is good and staff friendly, but it can get busy. If you want a lakeside table be sure to book in advance. I really enjoyed my meal of Brasato and Polenta and the kids enjoyed their pizzas. You are really spoiled for choice when it comes to restaurants in Lugano. Have you visited before? Where was your favourite place to eat?